Silverback Open Championships 2016: The $100.000 jam! Bad Judging at Red Bull BC One? Lets go to the mid 90’s and the birth of what was to become the bboy/bgirl community in the USA. Breakin’ may have started in the 70’s but jams in the United States becoming what they are today didn’t really come about till the mid 90’s. In those days, it was all about meeting up, having fun, and getting loose. Jams didn’t have “competition” battles, the jams didn’t have categories. By the late 90’s, the competition aspect at these events was in full effect. Winners would usually get a trophy and some XXXL shirts from the sponsors. Mind you, some of these events were charging $50+ for a 2/3 day event. By the early 2000’s going to a jam and winning $100 or $200 dollars was consider a big deal. Soon after crew vs crew battles for $1,000.00 dollars started coming into effect. As social media became relevant and traveling to compete abroad became a reality, the events started giving out $5,000 or even $10,000 dollars. A few years ago at United Styles, Floor Lords gave away $35,000 in cash and $15.000 in prizes. It was the biggest pay out for any U.S.A event in history. 3 years ago Silverback Open came into effect and it all changed. Its now 2016 and we have Silverback Open Championships giving out $100,000.00 dollars. No prizes. Straight money. 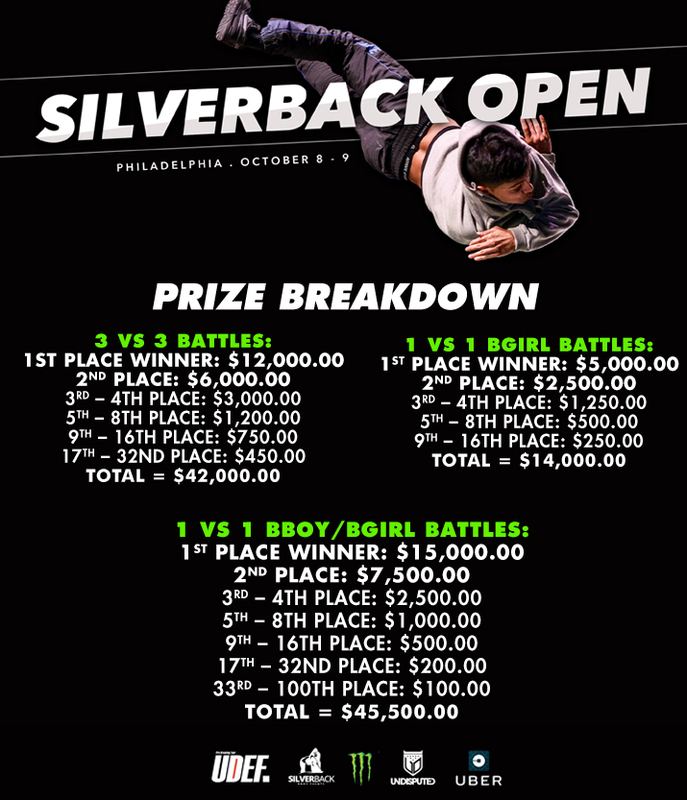 Check out the $ breakdown for Silverback Open Championships 2016. How far have we come as a community. Hopefully one day we get to write about the million dollar jam. Silverback Open Championships 2016: Oct. 8th and 9th, Wayne PA. Registering gives you access to community discussions, exclusive offers, and the latest news here at The Bboy Spot. Don't miss out! P.S. If you already have a forum login, you're already registered! Crap! Forgot your password? We got you! We can't tell you your password but we can reset it. Put in your email below and we'll send you instructions on how to reset it. Register to The Bboy Spot!